One of the servers (running Windows Server 2012 R2) has run out of free disk space on a system drive (C:\). I checked and cleaned all resource-consuming locations (WinSxS, TEMP folders, user profiles, outdated updates, etc. ), but it didn’t give a noticeable effect. There was still not enough disk space. At last, I have found that a large part of a system disk has been occupied by System Volume Information folder. 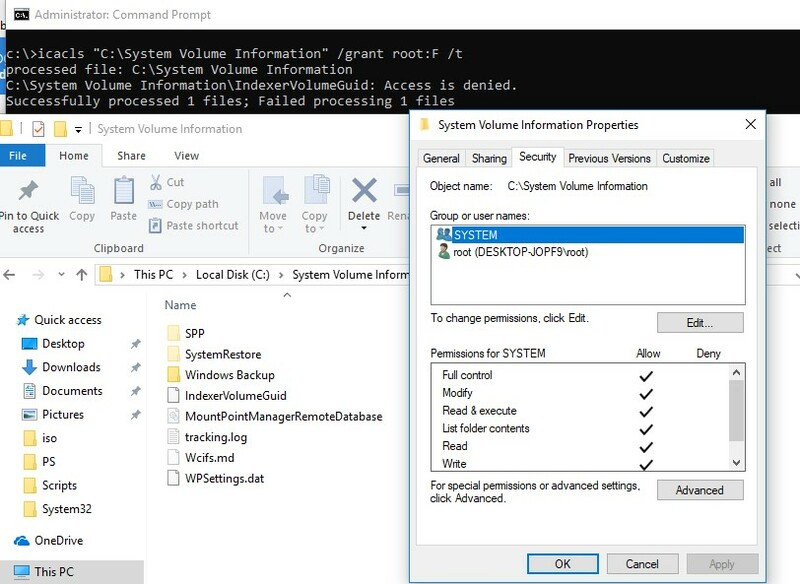 In this article I will try to tell you how the System Volume Information folder is used on Windows systems, what is stored in it, and how to clean it up . Note. 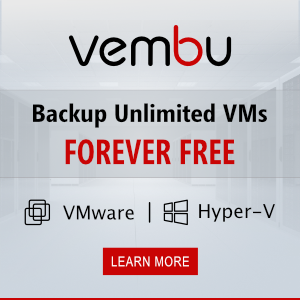 The instructions given in this article are applicable to other Windows versions as well: Windows 10, Windows 7, Windows 8.1, Windows 2008 R2 and Windows 2016 / 2012 R2. 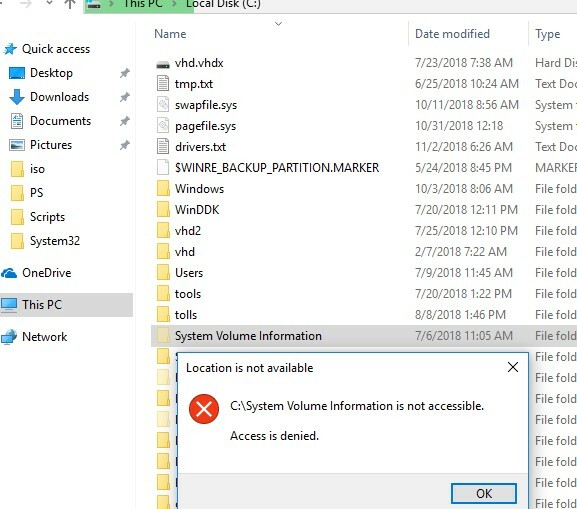 How to Gain Access to the System Volume Information Folder? What is System Volume Information Folder Used For? How to Clean Up System Files in the System Volume Information Folder? The System Volume Information folder is located at the root of each disk (be it a local HDD / SSD, or removable USB flash drive). It stores system data related to system recovery service, indexing, File History feature, etc. C:\System Volume Information is not accessible. Check in the folder properties on the Security tab that your account has full access permissions to the folder. If you use shadow copies on your computer or server to roll back to old versions of files / system states, keep in mind: each new VSS snapshot saves data to the System Volume Information directory, increasing its size. The more often shadow copies are created and the more often the files on the disk change, the faster the size of this directory grows. In the screenshot below, you can see that in the System Volume Information folder there is a system file larger than 160 GB. Note. It is not recommended to manually delete files in System Volume Information folder, since it stores information needed to restore the system and other important information. 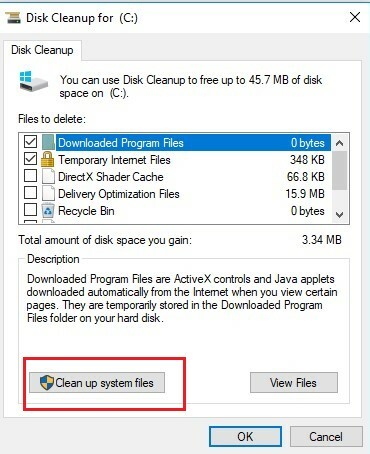 You can radically clean up the System Volume Information directory by disabling the system restore points and file history. But this is not always permissible. As you can see, 10% of system drive space C:\ is allocated for snapshot files and only 2% of which is occupied. If the value of Maximum Shadow Copy Storage space is set to UNBOUNDED, it means that the limit for shadow copies is not set and they may occupy all free space on the disk. By default, the system gives 10% of the total disk space to store this data. When you run the wbadmin delete systemstatebackup command in Windows 10, an error appears: “The DELETE BACKUP command is not supported in this version of Windows“. The fact is that in client systems (Windows 10/ 8.1/ 7), management of recovery points and limits is possible only from the GUI. 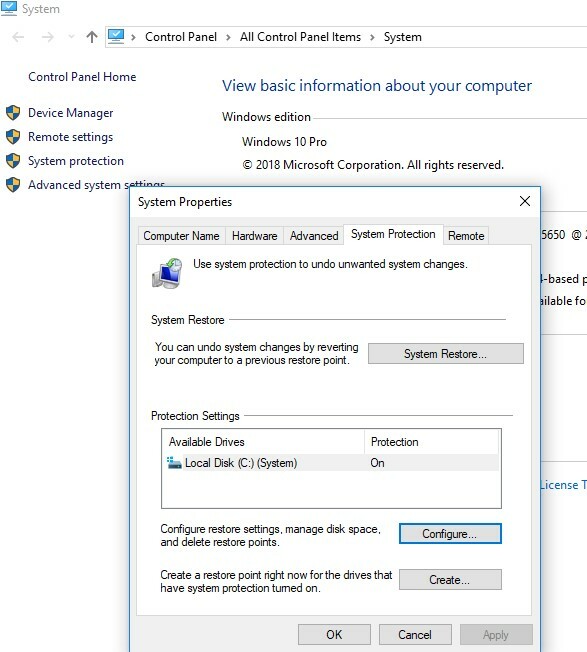 Open the System properties and click on the System Protection tab. By pressing Configure, we proceed to the settings of quotas for restore point storage. You can delete the existing restore points here. Select the system drive and click the Configure button. The quota configuration dialog box for storing system restore points will open. You can reduce the size of the disk for storing shadow copies. 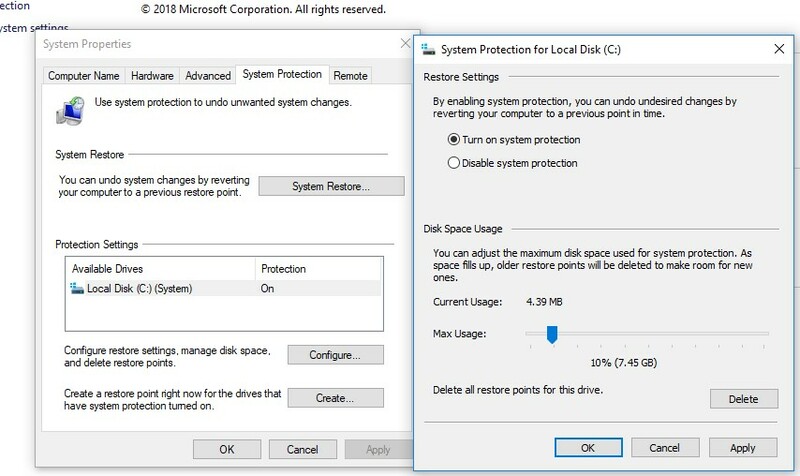 Here you can either delete all existing restore points (Delete button), or completely disable the creation of recovery points by selecting Disable system protection. If you use the data deduplication, you must disable deduplication and run the file de-optimization command: Start-DedupJob -Volume D: -Type Unoptimization (the command may take quite a long time, also make sure that the disk has enough free space). I found a VSS for one disk on another this way. Cleaned it up and voila: space back! Brilliant! the folder “sys.vol.info.” was huge. Approx 250 gb. Cleaned it with these litle tricks!!! Now i know where space were wasted due to misconfiguration of the limits of the disk space used by VSS. Life saver of the server! !